Update: (1) The offending panel is in #174, not #175. (2) Neilalien would argue that the panel does not show Doctor Strange getting hit on by a flamboyant gay man and finding him "beneath contempt"- but that Doctor Strange is calling a derogatory Mr.-Roper-like comment "beneath contempt". 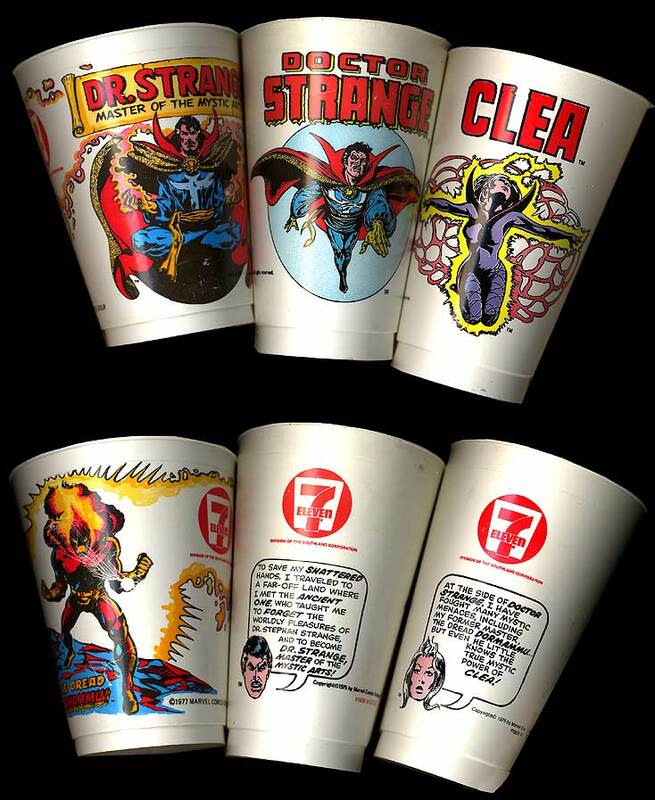 Isn't it sad, as far as any of the Doctor Strange uberfans can remember, that this might be the first Clea "non-printed-matter licensed product" since the 01975 7-11 slurpee cup [image by Howard Hallis]? Except for maybe a pog? The Dark Knight is a very good movie, that not only brings the superhero explodo, but explores some human psyche and society darkness much more interestingly (the superhero genre is indeed equipped!) than most of what currently passes for "taut psychological thrillers" (e.g., several films starring Michael Douglas). Heath Ledger's performance as the Joker is amazing and Oscar-worthy- it's his movie- and Neilalien must still say that even after skeptically trying to separate out the haunting meta knowledge and positive filtering that's undoubtably occuring re: it's sadly Ledger's curtain call. (It feels kinda silly to think that the same role Cesar Romero once giggled his way through could have killed him. Then again, one wonders how deeply Ledger went into his own depths in that hotel room alone for a month on two hours sleep and prescription pills while preparing for the role (Jack Nicholson warned him).) The current 95% on Rotten Tomatoes feels slightly bloated to Neilalien, though- because the film itself is slightly bloated. Neilalien would place it closer to 85%, and below Iron Man, which he enjoyed more- but to compare it to the fun tight Iron Man for determining this summer's best superhero flick is too apples-and-oranges. First, -5% to The Dark Knight for whiffing on this Rachel Dawes character twice now- neither Katie Holmes nor Maggie Gyllenhaal do anything for Neilalien. But more importantly, the Joker-bringing-down-the-best-of-us creation of Two-Face (and that fantastic Two-Face look and eyeball! digitally done) should have been the extent of Two-Face's appearance, maybe even setting the table for the next movie, which Aaron Eckhart would have ably handled. Instead, -10% for going full-through with Two-Face, which brings The Dark Knight to what plagues so many superhero franchise movies: too many supervillains at once, and thus a completely draggy and extra second ending (re: Two-Face and the Gordon family in peril). It's that weekend of weekends for comics: San Diego Comic-Con International! Have a great time everyone, and keep your noses out for Dr. Strange news! Cutting pages to maintain an unprofitable-for-newsstands 10-cent price began the ghettoization. John Constantine is ranked higher than Spider-Man!? That's just crazy talk. Look for a Doctor Strange series to spin out of "Secret Invasion." The great book is now in comic shops. Comics with "Strange" in the title. Doc's #1! Stan Lee assigned Stan Lee Media all of his intellectual property. A month later, Lee got something from Marvel, based on something. Does that mean Stan Lee Media can now get something from Marvel? Big press hit on the litigation, Peter Paul saga.